Polished New American cuisine, lovely cocktails and a swanky setting courtesy of culinary power couple John Broening and Yasmin Lozada-Hissom. : John Broening and Yasmin Lozada-Hissom, one of Denver's most notable culinary power couples, preside over the kitchen at this strikingly appointed, 170-seat restaurant in the heart of LoDo. The space, bedecked with leather booths and chairs, communal tables, expressive light fixtures, espresso-hued hardwood floors, two soaring wine walls and a bar area with banquettes propped with multicolored pillows, is offset by an exhibition kitchen and a sidewalk patio. 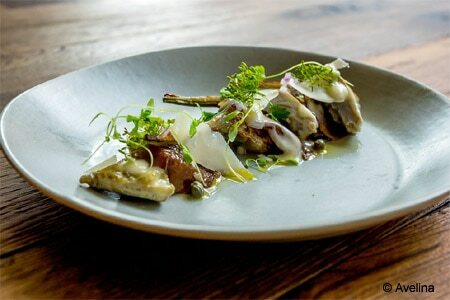 Broening's cuisine is what he calls "seasonal, rustic, wood-fired New American" --- expect a charcuterie board stamped with country pâté, brawn, duck liver mousse, coppa and smoked prosciutto to squid ink linguini weaved with fresh clams in a chowder broth. Desserts are the handiwork of pastry chef Lozada-Hissom, who satisfies sugar yearnings with the likes of the chocolate-hazelnut crunch cake bar paired with salted caramel gelato. The boutique wine catalogue, emphasizing bottles from Italy and California, runs deep and ballyhoos little known treasures coupled with familiar labels, while the cocktail roster is a spirit hound's nirvana.